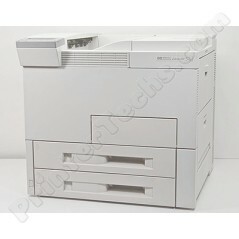 We no longer stock the LaserJet 5si printer. The HP Laserjet 5si is a fairly large workgroup printer. It weighs in at just under 100 lbs and measures approximately 2 ft cubed. This printer was designed for high volume printing -- it was a big improvement from its predecessor the Laserjet 4si. The Laserjet 5si printer was a standard workhorse in offices all over the world. The HP Laserjet 5si is a fairly large workgroup printer. It weighs in at just under 100 lbs and measures approximately 2 ft cubed. This printer was designed for high volume printing -- it was a big improvement from its predecessor the Laserjet 4si. The Laserjet 5si printer was a standard workhorse in offices all over the world. We no longer stock the LaserJet 5si printer. 21" x 21 " x 21"